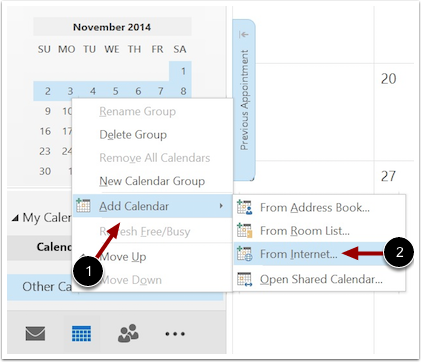 You can subscribe to the Calendar Feed using Outlook on your desktop. The calendar feed will contain events and assignments from all of your Canvas calendars. Once you have subscribed to the calendar feed, you can remove the calendar feed at any time in Outlook by opening the Tools menu, clicking Account Settings, and selecting the Internet Calendars tab. If you are using an earlier version of Outlook, these steps may differ. All future events, and past events within 30 days, are included when exporting a Canvas calendar to Outlook. Outlook periodically updates but may take up to 24 hours to sync with the Canvas Calendar. Canvas update may not be immediately visible in Outlook. If your institution/organization uses a Microsoft Exchange Server account, you can also subscribe to the calendar feed using the Outlook Web App in Exchange Server. This allows you to access your Outlook calendar online if you are away from your desktop. Please contact your IT administrator at your organization/institution for more information. For scheduler items, appointments must be viewed in the Canvas calendar for full appointment details. Copy the calendar feed link. Open Outlook. In the sidebar, click the Calendar icon. Right-click the Other Calendars link. Hover your mouse over Add Calendar  and click From Internet... . Paste the calendar feed link from Canvas in the calendar subscription field  then click the OK button . 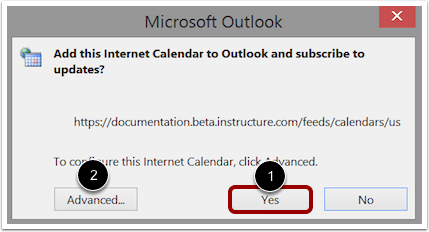 To confirm you want to add the internet calendar to Outlook and subscribe to updates, click the Yes button . To configure the calendar options, click the Advanced button . Previous Topic:How do I view a group calendar? Next Topic:How do I subscribe to the Calendar feed using Google Calendar as a student? Table of Contents > Calendar > How do I subscribe to the Calendar feed using Outlook as a student? Re: Is it possible to get push notifications of due dates exactly 24 hours from when they're due? Re: How can I sync my ICON calendar to my Outlook calendar? Re: Why is the calendar limited to viewing only 10 courses?